Hubby and I enjoy date nights about twice a month, and one of our favorite locales for a more casual night out is Red Robin. 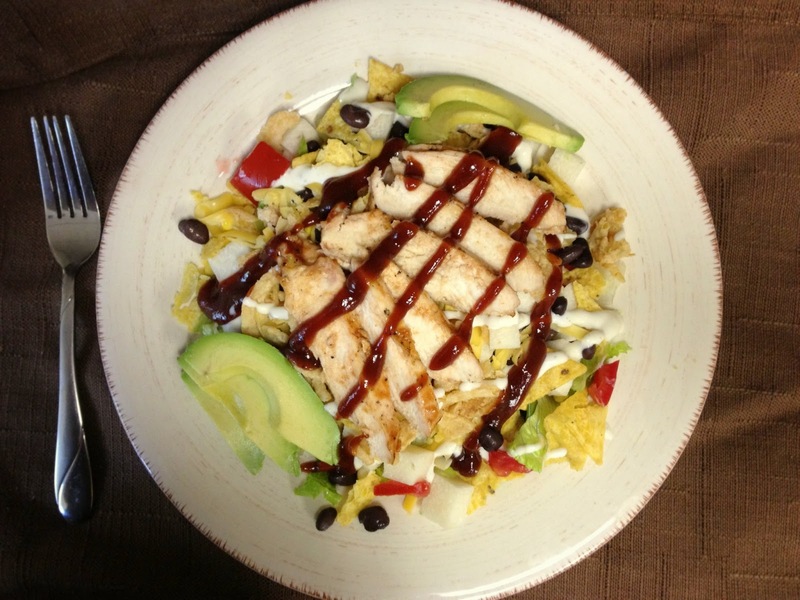 Known for their gourmet burgers, onion rings and thick shakes, they also boast quite a variety of alternate entrees- such as some stellar mouth-watering salads, sandwiches and wraps. You might be familiar with the Whiskey River BBQ trio- the burger, the chicken burger, and the wrap-, but have you met the latest addition to the family? 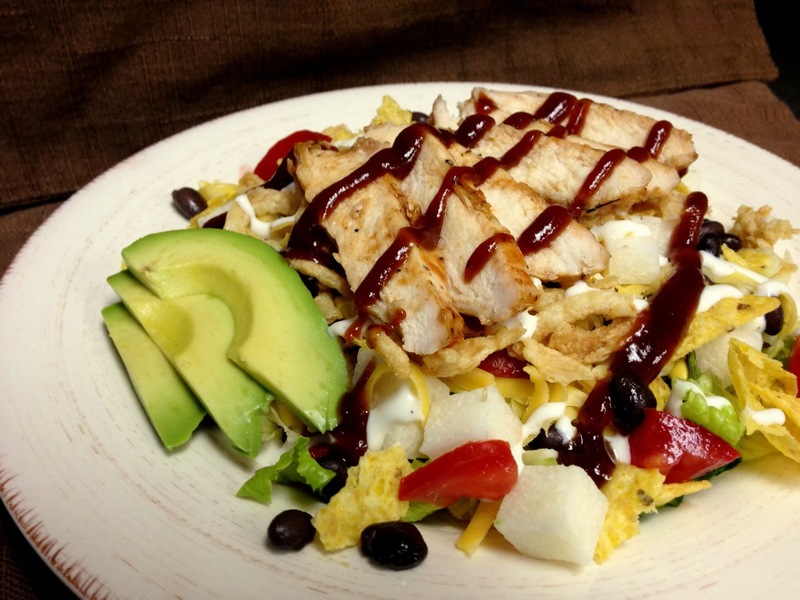 Several months ago I tried the new Whiskey River BBQ Chicken Salad- and fell in love. I quickly made a note of all the ingredients on my smartphone so I could try to recreate it at home- and finally, I have! If you haven't tried it at Red Robin yet, I encourage you to do so- but I'm also thrilled to bring you the easy, cheaper, customizable DIY edition! I think my favorite thing about this southwest salad is that it's just fun to eat! Every bite is an adventure- there are so many ingredients, you just never know what's going to be in your next forkful! It pops with color, flavor, and texture, featuring black beans, grilled corn, jicama, and much more! Tip: I had never worked with jicama before, but I discovered that if you slice it too early, it will dry out! Preheat grill to medium-high heat. Grill chicken 15-20 min., turning once, or until internal temperature reaches 170 degrees F. Meanwhile, grill corn in husks 15 min., turning every 5 min. (For a great tutorial on grilled corn, click here). During last 5 min. of grilling, brush chicken with about a 1/4 cup of the BBQ sauce. While chicken and corn are grilling, prepare salad ingredients. Toss romaine and iceberg together. When corn is finished grilling and has cooled slightly, slice the kernels off of the cob (this works best in a bowl with the cob standing vertically!). Slice slightly cooled chicken thinly. Assemble salad ingredients on individual plates as you like, though I suggest ending each serving with a drizzle of the ranch dressing, followed by the sliced chicken, a drizzle of BBQ sauce, and garnished with a few avocado slices. Enjoy your "night out" at home! Hi, thanks for the recipe. Just a clarification - this salad has been around at least 10 years but was removed from the Red Robin menu a while. However, they'd let you order it while it wasn't on the menu. Over time it has shrunk quite a bit and the price has gone up substantially. Last time I had it, it didn't come with the grilled bread any longer.